While many people think of travel rewards as pertaining to individuals, small businesses have just as much (or more) to gain by maximizing points and miles. Today, TPG Senior Points & Miles Correspondent Nick Ewen looks at several business credit card options from American Express that can serve you and your business well. Business credit cards can be a great way for small businesses to manage expenses and still earn valuable points and miles. They’re also not limited to formal businesses with EIN numbers; my wife and I both have an Ink Plus Business Card from Chase that we each opened as sole proprietors using our social security numbers. I find the Ink Plus card to be incredibly lucrative, and it regularly appears on TPG’s list of top travel rewards cards. However, there are many other flavors of cards that target business owners, offering a wide range of benefits. In this post, I’ll look at the extensive business card portfolio from American Express to help you determine whether any of them are a good fit for your wallet. This means that if you previously held a card like The Platinum Card® from American Express, but you were then targeted for a big bonus (like those we saw through Card Match earlier this year), you wouldn’t be able to earn that windfall even if your first account had been closed for years. Fortunately, you can apply for the business version of the card and still be eligible for the bonus, since it’s treated as an entirely separate product. Below you’ll find my analysis of each card, and my suggestions for who would be the “ideal” cardholder to maximize its benefits. All of these cards participate in the American Express OPEN Savings program, which provides you with additional earning or discount opportunities when you use your card to make purchases at select partners. If the card participates in the Membership Rewards program, you can choose between a 5% discount or an extra 2 points per dollar spent at places like Hyatt, Hertz and FedEx — if your card doesn’t earn Membership Rewards points, then you’ll simply get the 5% discount. This is an easy way to get even more value out of these business cards. For complete details, check out the OPEN savings website. 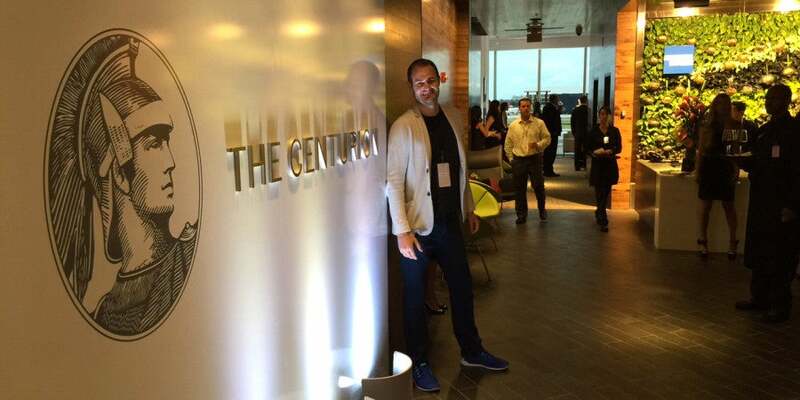 The Amex Business Platinum Card gives you access to a growing list of Centurion Lounges in the US. Current Offer: Earn 40,000 Membership Rewards points after you spend $5,000 in purchases on the card within your first 3 months of card membership (worth $800 based on my June Membership Rewards valuation). Benefits: Earn 1 point per dollar you spend on eligible purchases and 2 points per dollar on eligible purchases made when booking on the American Express Travel website. Enjoy complimentary access to over 700 airport lounges, including American Express Centurion lounges, Delta SkyClubs (though without guest privileges) and Priority Pass lounges. You can also stay connected with unlimited Boingo Wi-Fi at more than 1,000,000 Boingo hotspots worldwide and 10 complimentary GoGo Inflight internet passes every year. You can receive up to a $200 airline fee credit per calendar year, as well as a $100 fee credit for Global Entry or TSA PreCheck every five years. The card also incurs no foreign transaction fees when making purchases abroad, and includes automatic Starwood Preferred Guest Gold status. Authorized User Details: Additional cardholders cost $300 each, though they’ll enjoy many of the same benefits (including lounge access, a separate Global Entry credit, their own set of GoGo passes and SPG Gold status). Analysis: This card has the highest annual fee of all the cards on this list, but the benefits can easily surpass $450 every year. This card would be a good fit for anyone who travels frequently, as most of the perks apply on the road (like lounge access, Wi-Fi access and SPG Gold). This is also a great option for traveling abroad, since it waives foreign transaction fees. Even though the card accrues valuable Membership Rewards points that can be used in a variety of ways, it offers very little in the way of spending bonuses, so it’s not the best option for maximizing everyday purchases. You can earn 2-3 Membership Rewards points per dollar spent on airfare when you pay with your Business Gold Rewards Card. Current Offer: Earn 25,000 Membership Rewards points after you spend $5,000 in purchases on the card in the first 3 months of card membership (worth $500 based on my June Membership Rewards valuation). Benefits: Earn 3 points per dollar in one category of your choosing (airfare, advertising, gas stations, shipping or computing) and 2 points per dollar in the other four categories (up to $100,000 in purchases per category per calendar year). You’ll also earn 2 points per dollar on eligible purchases from the American Express Travel website and 1 point per dollar on all other purchases. You can also utilize a variety of included tools to manage business expenses. Authorized User Details: $50 for the first employee card and no fee for additional cards (waived for the first year). Analysis: Unlike the Platinum card, the Business Gold Rewards Card offers some very valuable spending bonuses on categories that are quite popular for small businesses, so this is ideal for those of you wanting to boost your Membership Rewards balance. Earning 3 Membership Rewards points per dollar spent works out to a 6% return. If you choose shipping as your 3x category and happen to use FedEx, you can earn an additional 2 points (or get a 5% discount) on top of that through the OPEN Savings program. The SPG Business Amex has some added perks coming next month, including access to Sheraton Club Lounges. Current Offer: Earn a $100 statement credit after you spend $1,000 on purchases in the first three months. Plus, an additional $100 statement credit after your first purchase at participating SPG or Marriott Rewards hotels in the first six months. Current Benefits: Earn 2 Starpoints per dollar spent at participating Starwood hotels, and 1 Starpoint per dollar spent everywhere else. Earn SPG Gold status after spending $30,000 or more in eligible purchases on your card in a calendar year. You also get 2 stays and 5 nights toward SPG elite status each calendar year just for holding the card. New Benefits (as of August 11th): You’ll no longer pay foreign transaction fees, and can access Boingo’s American Express Preferred Wi-Fi plan. You’ll also enjoy complimentary premium internet access at all SPG properties and free access to Sheraton Clubs when you book rates eligible to earn Starpoints. Analysis: This card is getting a much-needed facelift next month, though it will cost you an extra $30 per year. Starpoints are among the most valuable loyalty currencies out there — they regularly top TPG’s monthly valuations and are pegged at 2.4 cents apiece in his most recent version), so this is a good option if you’re looking for a solid card for everyday spending. It’s also a great option if you frequently visit SPG properties, as you’ll receive the equivalent of 4.8% back on those purchases, plus gain automatic access to the Sheraton Club regardless of your elite status level. It’s up to you to decide if these new benefits are worth the increased annual fee. The Delta Business Amex can be a nice complement to the SkyBonus program. Current Offer: Earn 30,000 bonus miles after you make $1,000 in purchases on your new card within your first 3 months. Benefits: You’ll earn 2 miles per dollar spent on purchases made directly with Delta and 1 mile per dollar on all other purchases. The card also comes with a free checked bag on Delta flights, along with priority boarding and 20% savings on eligible in-flight purchases. You can also use the card to get out of Delta’s Medallion Qualification Dollar requirement by earning the required MQMs and spending at least $25,000 in a calendar year. In addition, as of May 2014, all Delta Amex cards waive foreign transaction fees. Analysis: The calculus on this card is relatively simple, as I would recommend it for anyone with semi-frequent travel on Delta, especially out of a hub like Atlanta or Detroit. The current bonus isn’t earth-shattering, but it would cover a round-trip domestic economy ticket (as long as you can find Level 1 availability, which is now searchable on ExpertFlyer). The more valuable benefits would likely come when you hit the road; the checked bag benefit can save up to $50 for a single passenger on a round-trip flight, and no foreign transaction fees can offer substantial savings abroad. Remember, too, that you can double-dip by signing up for Delta SkyBonus, the carrier’s business program. This allows you (and your employees) to earn SkyMiles in personal accounts while also accruing SkyBonus points in your business account. Other options: If boosting your Medallion qualification on Delta is important to you, you may want to consider the Platinum Delta SkyMiles Business® Credit Card from American Express or the Delta Reserve for Business Credit Card. These offer many of the same travel benefits as the Gold version, but include additional perks like companion certificates (both), bonus MQMs for hitting certain spending thresholds each year (both) or even complimentary SkyClub access (Reserve card). In line with the greater benefits, these cards come with higher annual fees ($195 for the Platinum and $450 for the Reserve). For more information, check out my post on earning Delta status without flying. The SimplyCash Card is a great option to put money back in your wallet. Image courtesy of Shutterstock. Current Offer: Get a $250 statement credit after you spend $5,000 on qualifying purchases on the card within the first 6 months of card membership (must apply by September 21, 2015). Benefits: Earn 5% cash back at US office supply stores and on wireless telephone services purchased directly from US service providers (up to $25,000 in purchases per rebate year). You’ll also be able to earn 3% cash back from one of 7 categories of your choosing: airfare, hotels, car rentals, US gas stations, US restaurants, US advertising or US shipping (also capped at $25,000 in purchases). The card also gives you 1% cash back everywhere else. Analysis: This card is a great option if you don’t want to bother with redeeming points and just want to put money back in your pocket. Your cash back will automatically show up as a statement credit on the second billing statement after the period in which you make the purchase, so there’s no guess work involved. The 5% and 3% bonus categories should be useful to many small businesses, and even though the card doesn’t carry an annual fee, you’ll still have access to the OPEN Savings program. However, this card is a poor choice if you regularly (or occasionally) travel outside the US, since you’ll have to pay a 2.7% foreign transaction fee and lose out on bonus earnings. Current Offer: Earn 5,000 Membership Rewards points after your first purchase on the card (worth $100 based on my June points valuation). Benefits: Earn double Membership Rewards points per dollar of eligible purchases made when you book on the American Express Travel website. Earn one Membership Rewards point per dollar spent on all other eligible purchases. Use your points for gift cards or merchandise at over 500 leading brands. You can also use points to pay for airfare directly, or you can transfer them to one of sixteen partners (which tends to be the best option). Analysis: This card offers a low-cost way to access the lucrative Membership Rewards program, as its $95 annual fee is much lower than those of the Business Gold Rewards Card and Business Platinum Card. If you just want to get your feet wet and aren’t ready to commit to the higher annual fee, this can be a good starter card for businesses. However, I personally would choose the added benefits and earning bonuses on the Gold card over the relatively weak Green card. The Plum Card comes with a high annual fee, but offers you flexibility with both payments and spending limits. Current Offer: Get up to 3.5% back on your first $30,000 in purchases on the card in the first 3 months of card membership (ends August 24, 2015). Benefits: Earn 1.5% back on all eligible purchases when you pay your bill within 10 days of your statement closing date. Earn an additional $200 credit for every $10,000 you spend in the first three months (up to $600 in credits for $30,000 in purchases). Take some extra time to pay your bills, with no interest for 60 days after your statement closes when you make the minimum payment by the due date. You’ll also enjoy no preset spending limit and no cap on your 1.5% earnings, plus no foreign transaction fees for purchases made outside the US. Analysis: If your business is capital-intensive and requires a lot of upfront investment prior to recognizing revenue, this card could be a great fit with the expanded payment window and no preset spending limit. It’s also a great cash-back option when you make significant purchases outside the US. Unfortunately, taking up to 60 days to pay your bill in full does sacrifice the 1.5% cash back, and the $250 annual fee starting in year two is tough to swallow. Crunch the numbers to see if the SimplyCash card is the more lucrative option for you or your business. Current Offer: Up to 20,000 points – Get 10,000 Membership Rewards points after making your first purchase on the card within your first 3 months of card membership (worth $200 based on my June points valuation) plus another 10,000 when you spend $5,000 on your card within the first 6 months. Benefits: Earn 2 Membership Rewards points for every dollar spent on eligible purchases booked through the American Express Travel website, and earn 1 point per dollar spent elsewhere. Enjoy an annual relationship bonus equal to 30% of Membership Rewards points earned from purchases charged to your card during a card member year. Analysis: If you’re looking for a card that accrues Membership Rewards points without an annual fee, the Blue card is a great option. Though you won’t see any category bonuses on everyday spending (other than travel purchases made through Amex Travel), the 30% bonus each year can be a great boost to your Membership Rewards account. Just beware that the card does incur a 2.7% foreign transaction fee on purchases made outside the US. American Express has a plethora of business credit card options to choose from, and your individual spending habits and travel patterns play a large role in determining which one suits you best. Hopefully this post has given you some insight into how to make that decision and further maximize points and miles earnings for your small business. Which is your favorite American Express business card?